MILWAUKEE — The national law firm of Quarles & Brady LLP today announced that BTI Consulting Group, Inc., a leader in legal industry research, has named the firm to its Fearsome Foursome Most Feared in Litigation Honor Roll as well as the IP Litigation Powerhouse Honor Roll in its annual Litigation Outlook publication. Quarles & Brady is one of only 53 law firms named in IP Litigation and one of only 37 firms named among the most feared as opposing counsel. Quarles is the only firm in the states of Wisconsin, Arizona, Indiana and the metro areas of Tampa and Naples, to be named in both lists. 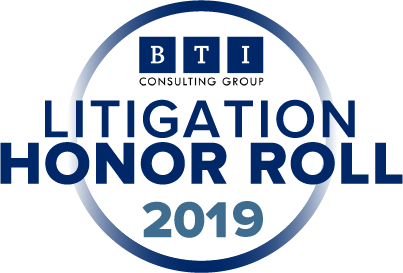 Each year, BTI reaches out to a strategically designed group of top legal decision-makers at large organizations with $1 billion or more in revenue. Over 250 law firms were analyzed based on direct, unbiased feedback from clients. BTI Litigation Outlook 2019 is based solely on in-depth telephone interviews with leading legal decision makers. This comprehensive analysis trends data from more than 5,100 corporate counsel client interviews conducted over the span of 19 years.